These 3 photos show the way God created the whales to live free in the oceans of the world, and free from the exploitation of humans. (Whales and Whale Exploitation - Slaughter - 02) Sea Shepherd reports: Faeroese children suffer from the highest levels of mercury contamination in the world. The mercury literally eats away brain tissue and may help explain how these people can engage in such barbarity. This level of ruthlessness is extreme even compared to the behavior of Newfoundland sealers and Japanese dolphin killers. (Whales and Whale Exploitation - Slaughter - 04) Some people try to say that there is no evil in the world and that everyone is basically good. The pleasure that these Faeroese people derive from torturing and killing these gentle pilot whales is proof that there is evil in the world and that they turned from God to do evil. (Whales and Whale Exploitation - Slaughter - 05) The killing frenzie continues in the Faeroe Islands, and the people chase down and brutally slaughter the pilot whales. (Whales and Whale Exploitation - Slaughter - 06) Evil attracts evil! 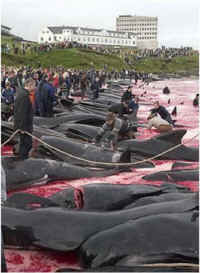 Everyone turns out to either kill or watch the killing of the pilot whales. (Whales and Whale Exploitation - Slaughter - 07) A killer and the innocent prey! (Whales and Whale Exploitation - Slaughter - 08) In this photo we can see that these people enjoy killing in the most brutal ways. No wonder so many people write to us and say that they are ashamed to be a member of the human race. (Whales and Whale Exploitation - Slaughter - 09) And other ask, "How could God allow this to happen?" The simple answer is that God gave the care of this world to us, and most people have made things worse. Jesus called on us to be blessed as peacemaking children of God (Matthew 5:9), which these people obviously want no part of. Paul writes in Romans 8:18-23 that the children of God are to free the whole of creation from it's present corruption, which is further proof that these people cannot be those children. Why hasn't the church taken a stand against this wanton killing, or are they part of the corruption, too? (Whales and Whale Exploitation - Slaughter - 09a) Undercover Sea Shepherd operative took several images of the July 2010 Faroe Island Pilot Whale slaughter. 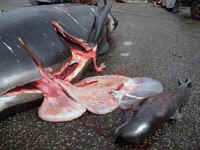 This image shows only one of many Baby Pilot whales who were cut out of their mothers' bodies and left to rot. (Whales and Whale Exploitation - Slaughter - 10) Whale carcass is stripped of meat in Iceland. October 2006. (Whales and Whale Exploitation - Slaughter - 11) Children watch a whale being butchered in Iceland. October 2006. (Whales and Whale Exploitation - Slaughter - 12) This picture shows what the Australian government says is the slain carcass of a minke whale tied to the Japanese harpoon ship Yushin Maru 2 in the Antarctic waters. 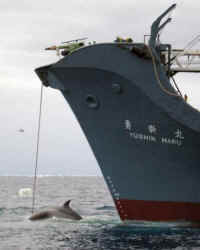 (Whales and Whale Exploitation - Slaughter - 13) A minke whale and her calf are towed up the rear ramp of the Japanese whaling vessel Yushin Maru No.2 in the Southern Ocean. (Whales and Whale Exploitation - Slaughter - 14) Two whales are dragged on board a Japanese ship after being harpooned in Antarctic waters. The pictures, plastered over front pages and shown on television were taken from an Australian customs vessel tracking the whalers to gather evidence for possible legal action to stop the annual slaughter. (Whales and Whale Exploitation - Slaughter - 15) An Australian Customs Service boat from the patrol vessel Oceanic Viking, right, tracking the Japanese whaling in Antarctic waters. The Australian government stepped up it's public relations campaign against Japanese whaling in Antarctic waters by releasing images of whale killings to Australian media organizations. (Whales and Whale Exploitation - Slaughter - 19) Pilot Whales fight for their lives against their killers. 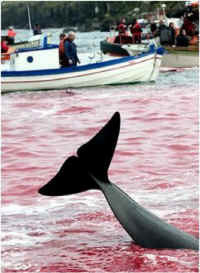 (Whales and Whale Exploitation - Slaughter - 21) This scenic bay is now red with the blood of slaughtered pilot whales. (Whales and Whale Exploitation - Slaughter - 22) What else could these people have used their energies for today besides killing friendly animals?